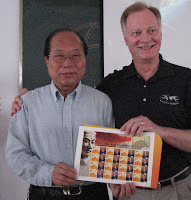 Global Volunteers has served in China since 1996. We have had all kinds of English speaking instruction, service teams to help judicial workers, and community construction. All of these service programs have produced an everlasting impact especially the English teaching to young kids and college kids who will shape the future in China. An outstanding example is one young boy who attended the teaching here at the high school and later became an expert English professor at the university. Global Volunteers has really changed a lot of young people’s lives.